The Irish Wildlife Trust says it has concerns about sea lice infestation, pollution and harmful algal blooms. 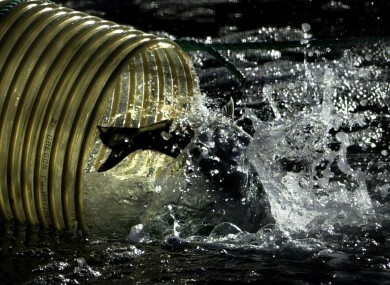 Image: A salmon farm on Loch Linnhe near Fort William. A PROPOSED FISH farm in Galway Bay is being objected to by the Irish Wildife Trust (IWT), which says that it will not be sustainable. The IWT has made a submission to the Department of Food, Agriculture and the Marine urging it not to grant a licence for a giant fish farm in Galway Bay that is proposed by Bord Iasciagh Mhara (BIM). The Environmental Impact Statement produced by BIM is simply not credible in asserting that there will be no significant negative effects from this massive development. The future of fish farming is now on dry land where these effects can be contained. It is short-sighted to believe that the ambition of Government agencies can simply be superimposed on a natural resource that is already seriously depleted. BIM is applying for a licence to farm Atlantic salmon off the west coast, saying it wants to develop three deep sea organic salmon farms that accommodate safe, efficient and sustainable fish farming. It says this is to meet market demand as well as create sustainable jobs in an area where they are needed. The BIM’s proposed deep sea fish farm could produce up to 15,000 tonnes of organic salmon every year, worth €102 million annually, it said. In turn, it would have a wages flow of about €14.5 million. The fish farming licence would be franchised to a commercial operator, said BIM, rather than being given to a private company. The operator would have to adhere to EU and Irish conditions as well as strict requirements set by the Bord. The proposed site is in the lee of the Aran Islands, 1.7km away from the nearest land mass, and all the enclosures will occupy an area of 180 hectares. There would be around nine vessels operating around the site, used in operation, crew work, feed storage and distribution. The IWT raised concerns in its submission on the proposed fish farm about possible sea lice infestations of captive fish, which could pass to young salmon migrating to the sea, “potentially devastating the important population of wild salmon in the Corrib river”. It also says that Galway Bay does not have the capacity to assimilate the quantities of pollution from fish excreta and waste food, which could amplify the effects of harmful algal blooms. The IWT also claims that the escape of captive salmon, “which go on to interbreed with wild fish, weakens the genetic resilience of the already threatened population of Atlantic salmon in Ireland”. Email “Objections to proposed Galway Bay organic fish farm ”. Feedback on “Objections to proposed Galway Bay organic fish farm ”.